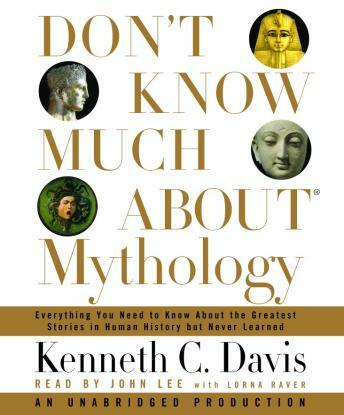 Employing the popular Don't Know Much About® style, with its familiar question-and-answer format, DON'T KNOW MUCH ABOUT MYTHOLOGY will explore the myths of the world, their impact on history, and their continuing role in our lives. It will offer listeners a wide-ranging, comprehensive, entertaining and listenable survey of the great myths of world civilizations, how they came to be, what they meant to the people who created them, how they influenced society, literature and art through history, and how they still speak to us today. Mythology is alive today in our art, literature, theatre, dreams, psychology--and certainly our language. "Pandora's Box," "Golden Fleece," "Labor of Hercules," and "Wheel of Fortune" are just a few of the words and phrases that come from a world of mythology and still color our speech. Using humor, contemporary references, and anecdotal material from mythology, extensive research based on recent archaeology which often reveals the history behind mythology and surprising information that breaks down conventional wisdom, DON'T KNOW MUCH ABOUT MYTHOLOGY will ultimately be about stories--the great and timeless tales that have fascinated people around the planet for several millennia.